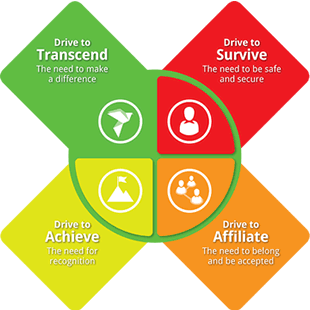 The six factors on which we focus our attention aggregate to provide an overall index that suggests the degree to which an individual has progressed on this personal journey. A critical aspect of this index is its relative nature, because it is reported in terms of the population in which you find yourself. This factor indicates the degree to which you view yourself positively and experience a sense of personal achievement in your life, readily facing challenges and acknowledging your ability to learn from your experiences. On the one hand, a sense of personal satisfaction and achievement may suggest self-confidence and even pride while, on the other hand, shame, embarrassment and a need to hide the truth about yourself may seriously lower your self- confidence. 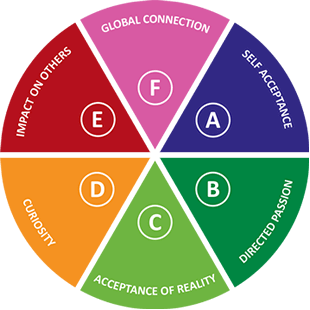 This Factor is one of the 3 Passive Personal Mastery Triads: (A) Self-Acceptance, (C) Acceptance of Reality, and (E) Impact on Others. These represent different aspects of the willingness to live with reality rather than oppose it. This factor provides an indication of the degree to which you have a passionate sense of direction in what you do in both your work and private life. This suggests, on the one hand, a strongly inner-directed sense of motivated purpose and drive, while, on the other hand, it suggests a somewhat disinterested approach to your work, arising from the need to earn a living by doing something about which you feel little or no passionate interest. 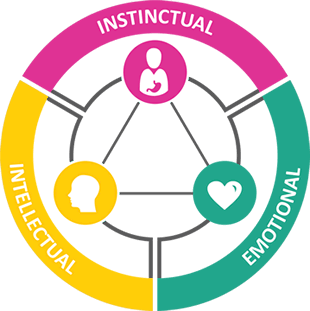 This Factor is one of the 3 Active Personal Mastery Triads: (B) Directed Passion, (D) Curiosity, and (F) Global Connection suggesting the expenditure of energy in pursuit of goals and connections in the world out there. This indicates the degree to which you are able to accept life and the circumstances of your life without resistance or discomfort. On the one hand, fully accepting that there are things that you are unable to change or even influence, it suggests an attitude of resignation and willingness to make the best of any situation. On the other hand, a dissatisfied and frustrated attitude may arise that is characterised by persistent anger and irritation directed at circumstances that are beyond your control. This indicates the degree to which you are inclined to ask questions and seek answers to these by various means including reading widely and making use of electronic media such as the internet. On the one hand, this may imply an open-minded and enquiring attitude to life suggesting a wide range of interests and a hunger for knowledge. On the other hand, a person with little interest in finding out more about the world around them is suggested. Such a person may believe that they already have all the answers that they need or have little inclination to ask questions for some reason. This factor indicates the degree to which you interact with others in a way that results in your being perceived as significant in their lives. While this could imply a person with an outgoing and sociable nature, this is not necessary, and the degree to which the individual permits others to come to rely on him or her for support in some way is more significant. The converse suggests a person who is rarely seen as significant to others and who may avoid situations in which others come to depend on him or her in any way, possibly having little need for the personal recognition or affirmation that this may elicit. This factor indicates the degree to which you feel connected to humanity as a whole in a way that transcends nationality or other limited group affiliation. This may imply an acceptance of all others as equal and the need to form connections with people around the globe in a widely spread network of personal contacts giving you a sense of being connected to humanity as a whole. Conversely, you may have a fairly strong sense of belonging to a single national or racial group and feel that those who are not members of this group are "outsiders" with whom you may feel little need to connect or interact. Emotional resilience simply refers to one's ability to adapt to stressful situations or crises. More resilient people are able to "roll with the punches" and adapt to adversity without lasting difficulties, while less resilient people have a harder time with stress and life changes. Psychological and social research have demonstrated that emotional resilience is something that can be learned or improved upon no matter what level of it we are born with. Living organisms exist in a close relationship with their environment in which they sometimes alter the environment to support them, or at other times, accommodate the demands of the environment by changing in, often subtle ways. The degree to which we are free to adapt largely determines our ability to survive and thrive and this rests on our sensitivity to both internal drives and environmental demands. Put another way; do we have the capacity to pay attention to social and biological imperatives as they arise and address them adequately? where each is reached only when its predecessor is satisfied. This drive emerges once the lower, or fear-motivated, drives have sufficiently receded from awareness and some sense of satisfaction has been achieved. This allows the search for a higher purpose in life to begin. 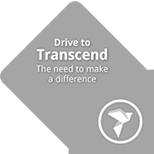 This is based on a need to make a difference that goes well beyond simple personal achievement, and is not directly intended to elevate the individual to a higher status. This drive draws attention to the need for food, shelter, clean water, physical safety and security; as well as the need to establish some means of ensuring its sustained satisfaction. If unmet, individual physical extinction is the ultimate result. 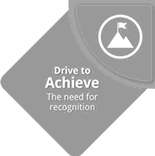 This drive strongly motivates individuals to seek an avenue of excellence, wherein they can contribute to the larger community in a way that is noticed, appreciated and gives them status. Internally, this helps to develop a sense of personal value and worth. This will be relatively absent if this drive is ignored or only partly met, resulting in an individual who leaves no legacy or mark on the world. 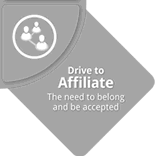 This drive shapes individual behaviour to conform with the norms and standards of a primary family or social group, to ensure acceptance and inclusion as a member. Failure to address this leads to exclusion, and the experience of an outcast and/or a life in exile. The three Energy Centers refer to three different ways of processing what we experience and affect our sense-making and decision-making. As a result, they can also be thought of as three distinct Centers of Intelligence. An individual may have balanced Centers which implies relatively equal access to all three. Alternatively one of the Centers may dominate, in which case there is a possibility that the individual over-uses this dominant Center and accesses it even in contexts where it is inappropriate. The context determines which of the Centers is most appropriate to rely on and utilize, or what combination is best. The three centers of intelligence are related to areas of the body. Each represents a specific modality of mind. This center, associated with thinking, represents the degree to which you are inclined to use logic and reasoning in approaching the world. A strong focus here implies a tendency to be somewhat uncertain in your approach to the world which may result in hesitation before action and an inclination to keep people at a safe distance until you come to trust them. Associated with feeling and emotional sensitivity, this centre represents the degree to which you use a sensitive and emotionally aware approach to the world. A strong score in this centre may suggest that you create a mask which you present to the world in place of your genuine self which is designed to provide you with the personal significance, otherwise, may feel that you lack. 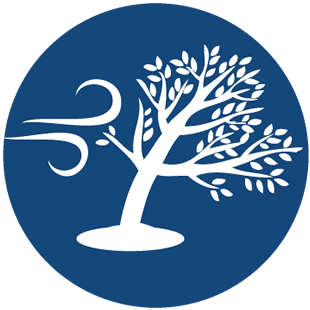 This center is associated with power, action and an intuitive approach to the world. A strong score here is taken to indicate a forceful and directive approach to life and a tendency to rely on your sensitive intuition in setting a way forward for both yourself and others. Some people who are strongly dominant in this centre, paradoxically, appear to lack forcefulness because it is not always expressed outwardly. Ennea is a Greek word meaning the number nine, and you’ll notice that there are nine numbers in the model, each representing a particular ‘way of being’ and behaving. The word ‘gram’ is also Greek and refers to something written or recorded. The Enneagram is an ancient model, which describes human behavior and the underlying motivations or drivers of behavior. It’s a complex model and very predictive in terms of indicating how our behavior alters as we become more pressurized and stressed versus becoming more relaxed and comfortable. None of these ‘nine ways of being’ is better than or worse than any other. All can function exceptionally well and in a positive way when they are operating at their best (very high in Personal Masteryand Emotional Resilience) and all can be very damaging and destructive when operating at their worst (very low Personal Mastery and Emotional Resilience). Associated with a keen eye for detail and a tendency to notice what is wrong and how it can be improved, people who have these characteristics may be rather critical of others but try to avoid being criticised. They are compliant and reliable, doing what they believe is right in any situation, carefully following instructions and upholding standards all of which rests on their strong sense of responsibility and accountability. Individuals strong on this point are caring and supportive towards others in order to get the recognition and appreciation they require. While they may tend to put their own needs aside which can result in some degree of personal frustration, they take pride in being able to meet others' needs in practical ways. They present a helpful image to those they encounter which gives them a feeling of significance and this may, otherwise, be somewhat absent. Those who are strong on this point are driven by success and achievement and may work very hard to be recognised as capable and worthy. Tending to structure their time carefully so that they achieve the most out of every moment of their lives, they are sometimes inclined to be somewhat "workaholic" and leave little time for relaxation and a social life. They may avoid emotional situations and tend to suppress their own feelings which can result in difficulties with personal relationships. This point suggests strong original creativity and a tendency to present an image of uniqueness and difference, setting them apart from others and giving them a feeling of personal significance. With a deep emotional sensitivity, they are able to sense others’ feelings and respond to these with depth and understanding. Sometimes feeling like misunderstood outsiders, they seek to be accepted and recognised for the innovative way in which they approach the world. Tending to keep apart from others and isolated to some degree, this suggests a person who feels more comfortable working alone or with a small group of people who have similar interests and approach. They are often attracted to technical or academic fields of endeavour which allow them to accumulate information. This assists them in their quest to understand the world. They may be quite easily overwhelmed in others' company and need to withdraw into seclusion when it becomes more than they can endure. This point is associated with a careful and sometimes over-cautious approach to life that may suggest difficulties both with personal decisions and taking quick, decisive action. These individuals are team players and prefer to work in clearly identified groups with a well defined purpose that gives them a feeling of security and confidence. They are concerned about safety and quickly notice ways in which things can go wrong. 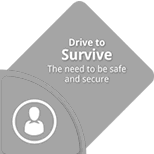 This enables them to take preventative action well in advance of the problem actually arising. This point suggests individuals who are lively and enthusiastic in their approach to life and who tend to live in the future, often becoming engrossed in plans and schemes that keep them stimulated and excited. With an uncanny ability to motivate others, they are often able to lift the mood of groups with whom they work and keep them engaged even when taking on long and possibly tedious operations. Quite easily bored, they tend to be great starters of new projects but may try to avoid maintenance tasks. This point suggests individuals who are naturally dominant and readily take charge of situations, getting things done with energy and drive. Often outspoken with definite points of view, they tend to like getting their own way and overcome any obstacles they encounter by means of their forceful personal strength. Inside the strong exterior there is a gentle and warm person who cares for others and will specifically take on assisting people who try to overcome the rough deal they get out of life through no fault of their own. With a strong need for peace and harmony, people in this point are inclined to avoid confrontation and try to reconcile people who have differing opinions by providing them with ways of seeing things in a different way. Because they avoid expressing their own opinions, they may appear to be excessively neutral to the point of being unnoticed. Yet, kind and gentle in their approach, they are willing to consider any point of view and tend to accept other people without judgement or criticism. A huge source of conflict in the world is the ungrounded assumption that, "Everyone sees the world the same way that I do". Ennea International's use of the enneagram (included in the 5LQ™ Personal Feedback Report) not only reveals the Enneagrams' nine different ways of being in, and seeing, the world, it also reveals the underlying driver that causes people to have their particular, often fixed, view. This understanding is a key that unlocks personal growth. Often, when teams aren't functioning optimally, we find that the cause is seldom about the technical ability to do the job. Instead, it is far more likely to reside in the quality of interpersonal relationships e.g. conflict caused by a lack of understanding or intolerance for different behavioral patterns. 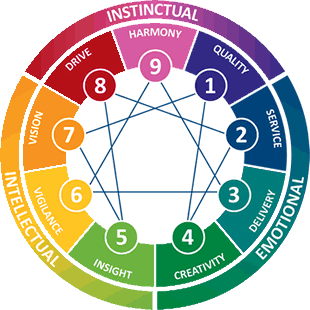 Understanding the nine behavioral styles revealed by the Enneagram is one of the most powerful ways to unlock the mutual understanding that is key to good relationships – the kind of relationships that are essential for a high performing team. In order to become high performing, a team needs to understand how a high-performing team operates, be inspired to strive for this vision, understand where the team currently is in relation to high-performance, and navigate the developmental route to that vision. We firstly unpack the 'current narrative' in the team and measure this against a well-researched team stage model in order to locate the starting point. Depending on the team's developmental challenges, we facilitate either a one-day TDD or two-day TPP off-site workshop to begin this developmental journey. Understanding differences can take us only so far; navigating them effectively will take us even further. No team can move to high performance if its members cannot deal skilfully with conflict. In this, the first of six one-day off-site action learning modules, we introduce and practice a simple and effective methodology for dealing with conflict. Next, the team members need to become skilful in offering and receiving feedback. In this one-day skill-building module, we help the team clarify a feedback model then practice offering and receiving feedback real-time, using real themes in the team. We then, as with all the skill modules, require team members to commit to, and be accountable for using and practicing feedback in the workplace. The next important step is to establish trust and create shared values and alignment in the team. Trust is an essential element in any high quality relationship, including in the context of high performing teams. In this module, we explore what trust is and what is practically required to earn it. The team also explores and defines shared values and what these mean behaviourally in the context of the organizational value framework. It's then important to remove divisive 'silo mentality' and enable the team to develop the capacity to think together in collaboration in order to solve real business challenges. In this module we introduce and practice an easy-to-use model that enables creative problem-solving through team collaboration. In practice sessions, the team works with real business challenges they are currently facing. This module is designed to help team members acquire the skill to help others think through and solve their own challenges and workplace problems rather than the team member diving in and solving problems for them. Essentially, team members become thinking partners for others rather than problem-solvers for them. Here people are taught to communicate in a way – using active listening and open questions – that gets others to solve it for themselves. In order to sustain high performance, a team needs its members to display resilience – the ability to bounce back from difficult or stressful situations. This module facilitates the development of inner strength at the level that enables each member to face challenges with confidence and self-assurance. The foundation of The Nine Essentials ™ for building high performing teams, starts with our first 3 essentials: establishing an Understanding of Self, Others and My Team. This foundation allows the rest of the Skillful Conversation series to flow. It is custom designed from the 5LQ™ Development Platform for your teams' needs. Although we recommend running the series in order, it is flexible enough to adapt to your teams' specific profile, once the foundation has been completed. Ennea International focuses on Human Development, and in particular, the building of Personal Mastery, resulting in extraordinary outcomes for individuals, leaders and teams. We design and build products, develop powerful processes and underpin our programs with systems thinking and Integral Coaching methodologies. Ennea International offer distribution opportunities. Apply now to become part of this innovative and fast growing international business that focuses on team and leader effectiveness solutions. A distributor is an individual or business entity authorized to distribute the Ennea range of products, materials and delivery that fall within the "Five Lens Development Platform™". IT'S DOWN TO ATTITUDE, OUR APPROACH AND THE WAY WE TREAT OUR CLIENTS. We aim to influence others in a positive way and we are equally open to being influenced. We keep our promises and commitments, and communicate pro-actively if, for some reason, we can't. We individually and collectively hold ourselves accountable for the quality of our work and our interactions with others. We are willing to take calculated risks and make mistakes. We learn from our mistakes. We foster a culture of innovation through ongoing research into new practices. 6 Important Paths to Success! Effective facilitation is essential to creating and sustaining an environment in which teams and workgroup communities can thrive. What is the Ennea Faculty? They are competent facilitators that are fully certified and have been hand-picked to run our Ennea programs. Why use a faculty member? Get quality facilitation when you need it. Our facilitators have gone through rigorous testing, completed case studies and proven themselves during observed facilitation. The following individuals are authorised Ennea Facilitators. Their contact information is listed here so that those interested in an individual Ennea Assessment (PFR™) or having a Team and Workgroup Program (TDD™ & TPP™) using the 9 Essentials™ to Building High Performing Teams may contact them directly. More Facilitators will be listed as they complete 5LQ™ certification. Your message was sent! We'll contact you soon!